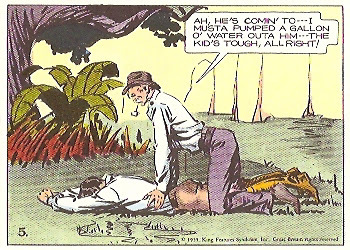 JJ05 (7.10-1934-7.7.1935): With this adventure, whose duration is more than that of all previous episodes combined, the creativity in 'Jungle Jim' blossoms with regards to both the art and the content. After the death of her villainous father, Joan seems to have settled with Jim for the time being, and Zobi the jungle-boy has parted them; hence, a scantily-clad adolescent boy has departed and left the scene for a young woman. The adventure truly kicks off with the arrival of a seasoned adventurer named Malay Mike who claims that the extinct species of saber-tooth tigers live in a valley where no man other than himself has set foot in. Sceptic and yet intrigued, Jim nevertheless set out an expedition on this tip. Grisly sights such as the below mise-an-scene encountered at the onset of the expedition signal that this adventure will be no routine stuff. Jim and his companions discover more than saber-toothed tigers in the valley where an extinct volcano has been hollowed out and turned into a fortress and a religious temple, the headquarters of a Chinese despot bent on exploiting the gold mines in the region. While the presence of a Chinese villain is superficially reminiscent of the 'Yellow Peril' narratives in the vein of Fu Manchu, the fact that a Chinese secret agent as well as local (Malayan) natives join forces with Jim and friends rule out this adventure from such racist territories. In terms of graphic design, Raymond experiments with several styles in the course of this long adventure which starts as a 'three-tier' (three rows of panels) as were all the previous adventures. On the Dec. 12nd page, he begins to introduce larger panels among regular-size ones, thus breaking up the neat panel-row structure. For several weeks, he alternates between this irregular format and a two-tier format, abondoning the three-tier format completely. From February onwards, the page even leaves out the oblong-size format altogether and becomes taller than wider. Towards the end of the adventure, it reverts back to the oblong-format, settling with a two-tier structure. Meanwhile, the routine "to be continued" tagline at the end of each page has also disappered, eventually giving way to the announcement of the subject of the coming weekly page. [JJ06] River Pirates (14.7.1935-27.10.1935): A simple adventure where Jim rescue a widow and her infant from a disgruntled ex-lover, the high point of which is Jim and Kolu being left buried in the sand for ants to devour them, not to mention lovingly rendered damsel-in-distress illustrations. Surprisingly, Joan departs with the widow to head back to the US, leaving a note disclosing that she loved Jim but did not want to impose herself on him (a situation which will be repeated in several early 'Phantom' adventures). Reading the note, Jim says to himself "what a blind fool I am", perhaps referring to the two nights ago where they had slept outdoors all along by themselves on opposite sides of the fire. 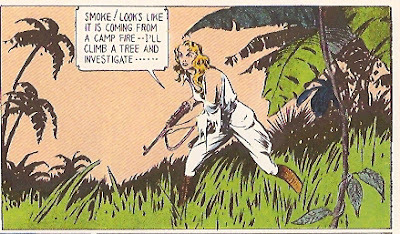 In the coming adventures, Jungle Jim will meet an imposing female, but that's another story, to be reconted in future postings in this blog. I really like the old newspaper strips, and Jungel Jim are among one of mine favourites. Your articles are well written and a pleasure to read. Looking forward to read your next post.